During the business summit set up by the French Chamber of Commerce and Industry in Morocco (CFCIM) in occupied Western Sahara, French companies could sign contracts on the spot – “putting them at risk of financial and reputational damages”, says WSRW. Above: CFCIM is actively promoting French business possibilities in the part of Western Sahara that is under current illegal occupation by Morocco. Over the course of last weekend, 3-4 November 2018, the French Chamber of Commerce and Industry in Morocco (CFCIM) has organised, in partnership with the Moroccan authorities, a business summit aimed at promoting investments and trading opportunities in occupied Western Sahara. In the past, the event had been organised in Paris or in Casablanca, in Morocco proper. This year's 2-days summit, however, took place in the town of El Aaiun (French spelling Laayoune), capital of occupied Western Sahara, even though it was announced to be located in "the country" of Morocco. On the forum’s website (or download), Laayoune-Sakia El Hamra is described as a vibrant and dynamic region of Morocco as well as a “future African hub and liaison with Europe”. During the course of the weekend, participants were presented with “investments opportunities” and were able to sign partnership and trading contracts on the spot. "One could question whether the Chamber of Commerce has the interests of the French companies at heart", says Sylvia Valentin from Western Sahara Resource Watch. "Engaging in business in Western Sahara comes with serious risks, ranging from financial and reputational damages to expensive court proceedings." The forum took place a few months after the Court of Justice of the European Union had issued its third decision in a row that expressively recalls that the territories of Western Sahara and Morocco are “distinct”; and only two weeks after the Front Polisario’s lawyers had initiated legal cases against six French companies currently doing business in the occupied territories. These companies have been challenged for the crime of “colonisation”, classified under war crimes under French Law, for which the Attorney General in Paris is competent. 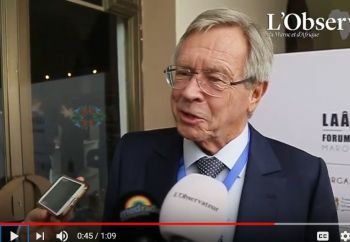 Chair of the The French Chamber of Commerce and Industry in Morocco, Mr. Philippe-Edern Klein, is an outspoken defender of French businesses in Western Sahara - which his organisation claims to be part of Morocco. Mr. Klein is everywhere online defending the Moroccan position to the illegal occupation. The French Chamber of Commerce set up a delegation in El Aaiun in 2017. Recently, its Chair, Mr Philippe-Edern Klein, met with the fact-finding mission of the European Parliament's International Trade Committee, tasked to assess the situation on the ground in view of the proposed extension of the EU-Morocco trade deal into the occupied parts of Western Sahara. Mr Klein - who was granted more time to speak with the mission than any of the Saharawi organisations living in the territory - favours the controversial trade arrangement, and reportedly pointed out that "in his view, for the political issue of sovereignty to be resolved, there first had to be economic development in the territory; that would subsequently make it possible to find a political response". The Chamber is actively promoting French businesses in the occupied territories. See for instance this promotion of aquaculture from 2018. Reportedly 23 French companies took part in the Forum, including Jean-Pascal Darriet, Director General of Lydec, a subsidiary of French multinational Suez, and Thierry Grosso, Director of Phénicia Conseil, an international recruitment firm based in seven African countries. In addition to clear rulings from the Court of Justice of the EU, strong statements on similar legal situations have been adopted by the UN. The UN General Assembly Resolution on Namibia (A/RES/40/52) stipulated that "any administrating or occupying power that deprives the colonial peoples of the exercise of their legitimate rights over their natural resources or subordinates the rights and interests of those peoples to foreign economic and financial interests violates the solemn obligations it has assumed under the Charter of the United Nations". Besides many networking and contract-sealing opportunities, the programme of the business forum included a visit of Phosboucraa, the fully owned subsidiary of Morocco's state-owned phosphate firm OCP SA, which is at the heart of Morocco’s illegal phosphate plundering. Transfers to and from hotels, airports and visit sites are all listed in the programme to ensure a controlled and monitored experience by the organisers.